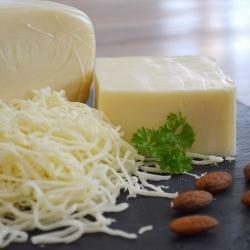 We often buy already grated cheese to enhance the taste of our pasta, pizza, or some other dish, but nothing beats the quality and taste of cheese freshly grated just before serving. - The strictly manual type which is made of a flat stainless steel metal piece covered with holes against which you grate the cheese. - Also manual is the cheese grater in which you place a small piece of cheese and grate it by turning manually a crank. - The electric grater which allows you to place a piece (or a number of pieces) of cheese into a compartment and lets the (usually cylindrical) rotating stainless steel drum do the job. The advantage of electric graters is that you can grate a larger amount of cheese without effort. Manual cheese graters always carry a bit of risk of grating skin off a finger. With electric graters there is no risk of hurting your fingers. Also, electric graters can be quite versatile as they can easily and rapidly grate other foods such as garlic, ginger, various nuts, chocolates, dry bread for crumbs, etc. We will consider here the Presto, Grandma Ann's and Omra electric cheese graters. Among the many graters that exist, these three have enjoyed the best reviews and are definitely among the most popular, and each respond to specific grating needs as described below. This is a professional-sized slicer/shredder that offers added power and capacity. The big food chamber can hold large chunks of cheese, whole potatoes, zucchini and more. It slices, shreds and grates cheese, vegetables, fruits and chocolate for delicious salads, soups, tacos, pizzas, desserts, and much more. It chops nuts, and makes bread and cracker crumbs easily and neatly. It comes with interchangeable processing cones that make thick slices, ripple slices, medium shreds, and super shreds. The adjustable food guide adapts to large and small loads. It is equipped with a handy funnel guide that directs foods right where you want them. Just point and shoot right into your salad. No extra bowls to clean. It is a lightweight corded unit portable to wherever an electric outlet exists. It is very easy to clean: The motor base wipes clean. All other parts are dishwasher safe. It is compact for easy storage. Fits most anywhere. Even in a drawer. ​Not only is Grandma Ann’s Electric Grater the perfect appliance for grating hard cheese in small or large quantities, but it can also be used to grate potatoes to prepare dishes like kugels, latkes, potato pancakes, and exotic hard fruits such cassavas, yucas or even coconuts. This heavy-duty electric grater is the ultimate kitchen workhorse, and thanks to it, what used to take hours of grating can now take only minutes. Indeed, you could grate 10 pounds of potatoes in less than 2 minutes! 2.75 qt stainless steel bowl. Slide hopper back on. Dishwasher safe. Durable and beautiful, this grater is certainly an heirloom to pass down to your kids or grandkids. The made in Italy OMRA electric cheese grater is a very sturdy and powerful machine, designed for maximum performance and long durability. It is capable of outputting 40lb of grated cheese per hour! ​It is suitable ford hard cheeses and other hard foods such as dried breads and biscuits to make your own crumbs. This grater is not recommended for softer cheeses. It measures 11 by 5 by 9 inches, and it is equipped with a large feed hopper for grating large blocks of cheese. It has a solid steel body construction and a steel grating drum. 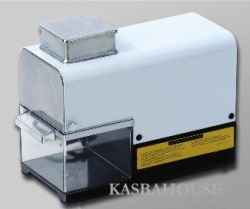 The 100 watts /110v machine needs to be plugged to be used, and therefore is more suitable for kitchen counter usage. The OMRA cheese grater comes with a 1 year manufacturer's warranty. The three cheese graters described above are all available on Amazon. Please click the Amazon link images provided below for exact price info or to purchase.